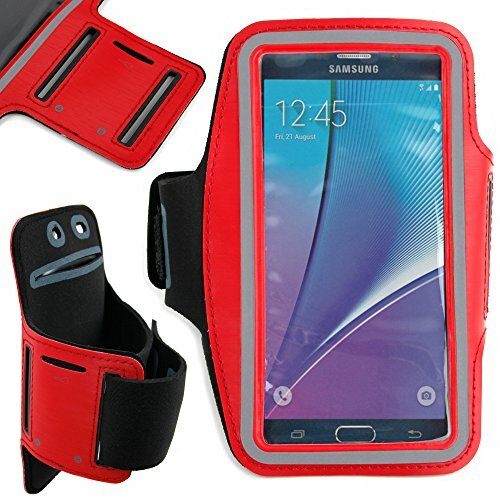 Introducing DURAGADGET's brand new and exclusive, limited edition sports armband for your smartphone, finished in classic red. Crafted from a super-soft, lightweight and flexible material, our ultra-portable sports armband is the ideal accessory to accompany you in the gym, whilst out running and jogging or playing tennis and cycling - it's dual-functionality offers versatile use for a range of activities. A transparent, clear front panel with optical clarity offers full capacitive touch, providing access to music, allowing fitness tracking and monitoring in-app and poses a new way to map out cycle and running routes - easily track heart rate, monitor distance travelled and workout levels all from your smartphone on your arm. We've ensured that the armband is soft and padded for an ultra-comfortable and secure fit. The armband secures around your upper arm and fastens to the strong velcro panel for anti-slip, anti-shake stability. An additional pocket to the inside of the armband offers storage space for credit and debit cards and an outlet for full access to your headphones. DIMENSIONS - Height: 155mm x Width: 75mm.